One of the perks of blogging is all the wonderful people I get to meet. People with a passion for delicious food, who totally get when I geek out over ingredients. At the last conference I attended, I had the pleasure to meet another wonderful person, who just so happens to work with Beanfields Snacks. Super funny, really sweet new friend, who can hook me up with tasty gluten free and vegan chips? Match made in buddy heaven! So when Beanfields asked, I jumped at the chance to make a recipe with their delicious chips for the big game. You heard about that big game coming up, right? To be honest, I usually can take or leave football. Game day for me is ALL about the snacks. Gotta have fun snacks! 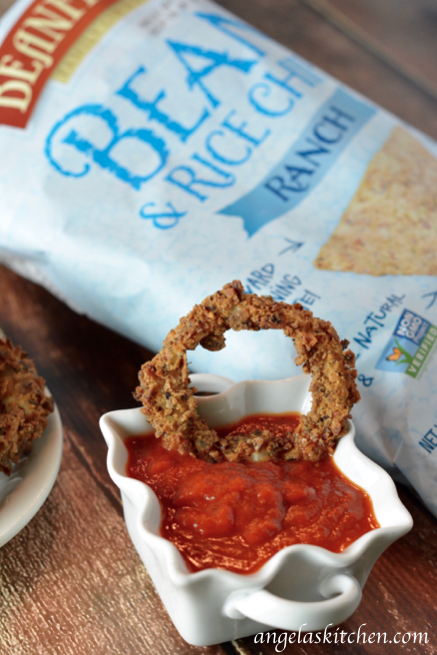 When I received a sample pack of chips from Beanfields filled with their Sea Salt, Pico De Giao, Barbecue and other flavors, I kept coming on back to the Ranch. As a gluten free and dairy free girl, I don’t normally get a chance to have anything done with ranch flavors, so had to try them for myself. Let me tell you, they are so good and I knew they needed to be used in the recipe I made. Besides, game food and ranch flavors just seems to go together, right? The best part is that these little babies are gluten free, dairy and egg free, vegan, nut free and can be made without any corn so they can be enjoyed by everyone at your get together. Even if your team doesn’t, I call that a WIN! Preheat oven to 400 degree F. Line 2 baking sheets with parchment and lightly oil with oil spray. Set aside. Peel onions. Slice onions ?" thick and separate slices into rings. Mix together gluten free flour and baking powder. Whisk in water and oil. Depending on flour blend you used, you may need to add up to ? cup more water to create a batter the consistency of thick pancake batter. Pour batter into a shallow dish. In another shallow dish, pour crush tortilla chips. 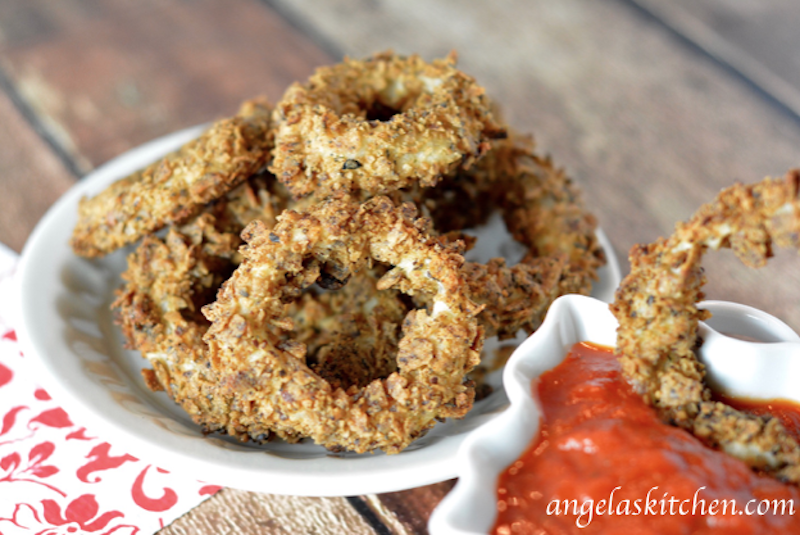 Using a fork or skewer, dip onion rings into batter, coating all sides. Tap off excess batter, as needed. Place onion ring into tortilla crumbs. Scoop crumbs over onion to coat all sides. Place coated onion ring onto prepared baking sheet. Continue with remaining onion. Spritz onion rings with oil. Bake in preheated 400 oven until onion is tender and coating is cooked through and golden, 15 to 18 minutes. Serve with your favorite dip. We especially like marinara sauce with this! While I created this recipe in partnership with Beanfields Snacks, all opinions and comments are my own.